Among the floating islands of Altara, the menace posed by incursions from the Domus forces Armano, a student of the Natural Arts, to wake the mythical, mystical GOGOR slumbering at the heart of their universe in an attempt to save his world and his culture. 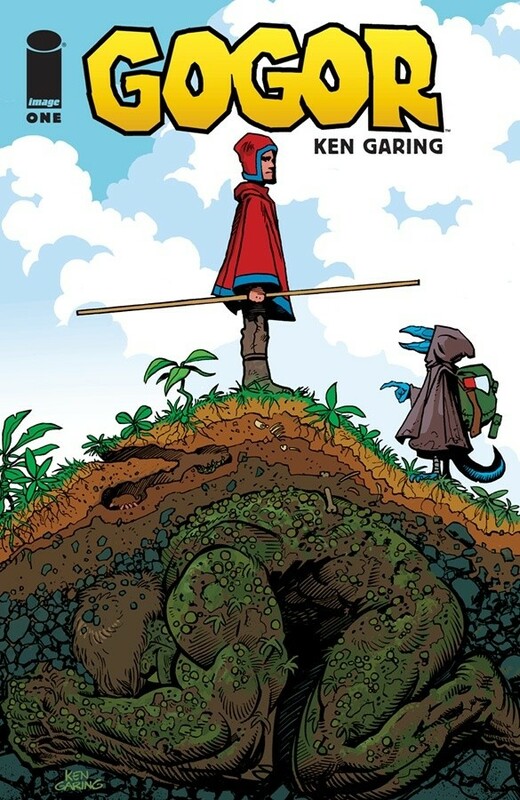 Ken Garing (Planetoid), brings us a magical, high fantasy tale that’s a feast for the eyes from the very beginning. I’m quite picky about the fantasy stories I read but this one has something about it that just clicked for me immediately. The concept isn’t particularly unique, but I absolutely love the delivery. The world Garing sets this story in is fantastic. Altara is a ring of floating islands, inhabited by a host of mystical creatures whose primary mode of transport is insects and rodents and I really feel like this has been inspired by some of the fantasy movies of the ‘80s that I grew up watching. The narrative never seems to take itself too seriously but never gets close to being a parody. There are some really interesting designs in this issue. The black-hats in the form of the Domus are, well, wearing actual black hats, along with what appears to be tactical armour, and their crossbows could easily be mistaken for assault rifles. This contrasts completely with the good guys who are wearing the typical medieval/Middle Earth style cloak and hood-type outfit you would expect to see. There are aspects that could be culled from a whole host of fantasy references, including Krull, The Dark Crystal, Willow, and pretty much anything Jim Henson was ever involved in. Saving the best for last, we have an elemental deity that is a fantastic blend of The Hulk and Swamp Thing. From the outset this story is slightly different from other fantasy books I’ve read recently in that, rightly or wrongly, my mind immediately went to this being an allegory on environmental change. I think that feeling comes from the artwork, with everything about the Domus being uniform, black, harsh and almost mechanical when compared to the organic, peaceful and varied world of the Altarans. I had a lot of fun with this story. As with all first issues, there’s so much we don’t know and plenty of teasers about what’s to come, and I’m really looking forward to seeing where Armani’s adventures take us in issue two.